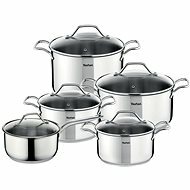 High-quality set of pots with various sizes Uno Tefal brand is ideal helper for every kitchen. All pots have thick walls with perfectly polished surface, solid three-layer bottom Induction and comfortable ergonomic handles. With little levels which are markings on the inside of wall of the containers you will always orient in the amount of materials in them you have. The package also includes relevant lids made of highly durable glass with steam valves. Superior stainless steel material is extremely resistant against to corrosion but also against the mechanical damage. You can even use all metal instruments. In addition it stands strong and resistance to thermal shocks and high non-stick material which makes your food guaranteed that you will never singe it. Thick three-layer based on Induction ensures an efficient and uniform heat distribution over the entire bottom surface of the container and the strength of the section. Your dishes will not even after years of using twisted or otherwise deformed. Pots Tefal Uno are applicable for all types of heat sources, including induction hobs. The big advantage is the possibility of insert the pot it into the oven with a maximum temperature of 180°C. Tefal allows you to washing soiled dishes in the dishwasher. You will literally thrilled by combining quality and reasonable price! All pots from Tefal are always guarantee of comfortable, fast, and last but not least for a healthy cooking. Ergonomic handles are providing you a comfort and also protection from painful burns. Dishes from Tefal are also completely harmless to health and is friendly to environment. 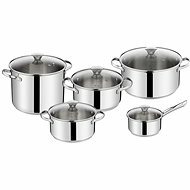 All pots are lead-free, cadmium or PFOA acid which is using for the production of cookware widely even though it is very dangerous for human beings and for the environment. 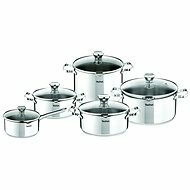 For shipping to other EU countries visit this page Tefal Uno Pot Set A701SC84 (10 pcs). Für Versand nach Deutschland, besuchen Sie bitte Tefal Uno A701SC84. Chcete doručit zboží do Česka? Prohlédněte si Tefal Sada nádobí 10ks Uno A701SC84. Chcete doručiť tovar na Slovensko? Prezrite si Tefal Súprava riadu 10 ks Uno A701SC84. Für Versand nach Österreich, besuchen Sie bitte Tefal Uno A701SC84. Magyarországra történő kiszállításért tekintse meg ezt a termékoldalt: Tefal 5 darabos edénykészlet Uno A701SC84.